How common is Multi-Tasking with the Smartphone for the Pedestrian Commuter? A week ago, it was reported that the city of Philadelphia would begin ticketing pedestrians for texting while walking. While that report has since been refuted by the city of Philadelphia and offenders will not be ticketed but rather only reminded to be careful, the conversation and curiosity around the practice of multi-tasking with devices while walking is picking up around the world. I’ve had a similar curiosity over the past year during my walking commute in downtown San Francisco. As part of my commute in my previous job, I would see commuters each day in the streets of San Francisco and my curiosity had me asking: “has the proliferation of smart phones made listening to or looking at their phones as essential to the daily commuter as getting that Starbucks coffee before making that last stroll into the office.” My analytical inclination led me to do some simple, research of pedestrian commuter habits in downtown San Francisco. As part of my commute each work day, I took the Caltrain near my home to the final stop at 4th Street and King Street in downtown San Francisco. From there, I decided to walk to the financial district of SF where my office was located—a daily one way walk of about 25 minutes—a great way to get exercise. Here’s a map of my walk with pins for the beginning and end locations. I decided to use these daily walks to perform a social experiment and measure some urban commuter demographics. Step 1: I used the Iphone apps TallyCounter and Tallymander to tally the number of people I passed while making my walk over the course of several weeks. Step 2: Each tally was done at the same time on different days of the week—I’d usually arrive at the Caltrain station around 8:40 and make the walk between 8:40 and 9:10 AM. My route was the same each day, up 3rd Street and ultimately to the office on Sutter Street. Step 3: I only counted people who I passed, those walking in the other direction. That way I could get a good look at them. I did not count people walking with me in the same direction. Thus, people who were also coming from the train station and making the same walk were not counted. Step 4: My first count was to count the baseline—how many total people did I pass during my walk. I took the average tally of two walks to serve as the baseline. Step 5: I then chose a few different activities or characteristics and made my tallies—counting each one twice over the weeks and using the average. People walking with a coffee cup or other beverage container in their hand. People walking while talking or reading from their phones. People walking while talking to someone else. My baseline count turned out to be 328 People, 55% Male and 45% Female. People walking with earphones (16%) is as common as many more human needs activities- drinking coffee (14%), talking with others (11%). More people while walking are using their phones (16%) to listen to music or podcasts than talk on the phone, text with their phones or read content (7%). 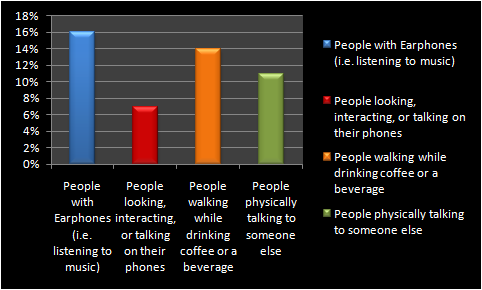 Majority of people are just walking—not listening to music, not talking on the phone, not even holding a coffee cup. Overall, the answer to my initial question about whether using their phone has become as integral as getting coffee in the morning for urban pedestrian commuters would have to be a Yes! While of course a small sample size and not statistically signifacant, it seems that people don’t necessarily have to have accompaniments like music or coffee while walking to work, but of those who do, they’re as likely to be listening to music as they are to be drinking coffee or talking to a fellow commuter. This research won’t lead to any Nobel Prizes, but hey, I needed some way to make my morning commute more interesting.